Noor Iqbal, an elementary school teacher and weaver of the prayer rug, worked with Kit Wilson to brainstorm ideas of the design, and translate the designs into something that was feasible to weave. We express our stories in many ways, such as through literature, film, and song. Art is about telling a story of who you are, or what your world is, in a capsule that can be digested by any of a person’s five senses. It is a window into a unique story. This is the story of a rug. A rug that, woven into its fabric, are the stories of Alberta, its people, its land, and the Muslim settlers who, over a century ago, came here to start their own lives. This is the story of The Canadian Prayer Rug. Five times a day, every day, Muslims stand facing the direction of Mecca for prayer. Typically, they’ll be standing on a prayer rug. For the most part, their eyes won’t be focusing on the intricate arabesque designs of the rug, the arches or monuments depicted on the fabric, or the colours or patterns woven into it. Their focus will be on a higher power, God, and when they are finished with their prayers, the rugs will be folded up and tucked away, perhaps in a cupboard or closet. But these rugs have much more to say than just being a simple cloth to pray on. They are a medium for cultural expression. They reflect the culture and values of the people who make them, and the places they are born in. From the symbols used, to the type of material, to the patterns and designs, these rugs tell stories: stories of belonging, of history, of place, purpose, and faith. Omar Yaqub, a professor of Social Entrepreneurship at the University of Alberta, recounts his travels in the Middle East. The prayer rug he carried with him belonged to his grandfather and had been passed on to him. It followed Omar through his journeys, from the sacred pilgrimage of Hajj, to Tanzania, Turkey, Pakistan, Nigeria and more. Wherever he went, he saw a myriad of prayer rugs, all made of different materials that were indigenous to the land, with varying colours that were used by locals, and many different symbols that were culturally important. A few years later, the Edmonton Heritage Council put out a call for applications for creative cultural projects. Omar, also a board member of the Edmonton-based not-for- profit, Islamic Family and Social Services Association (IFSSA), saw potential for a project that could highlight Edmonton’s Muslim community and help both them and the public realize their roots in the broader Canadian context. Omar and the team at The Green Room, IFSSA’s youth program, put together a grant proposal and submitted it to the Edmonton Heritage Council. That project would be The Canadian Prayer Rug. The goal of the project was to create a prayer rug that spoke to the history of Edmonton’s Muslim community, the culture of Alberta, and also pay tribute to the Indigenous people who live on Treaty Six Territory. In the broader sense, it was meant to contribute to the creation of a uniquely Canadian Muslim identity, and help Canadian Muslims realize the roots they have in this province and in this country. Edmonton’s Muslim community has been around for almost as long as there has been an Edmonton. The Al Rashid mosque was built in 1938, only 30 years after Edmonton was declared a city. A community of Syrian and Lebanese immigrants garnered donations from members of all monotheistic faiths in Edmonton. The land it was built on was donated by the City of Edmonton. It was designed by a Ukrainian-Canadian architect, resembling a Russian Orthodox Church, and is recognized as the first purpose-built mosque in North America. 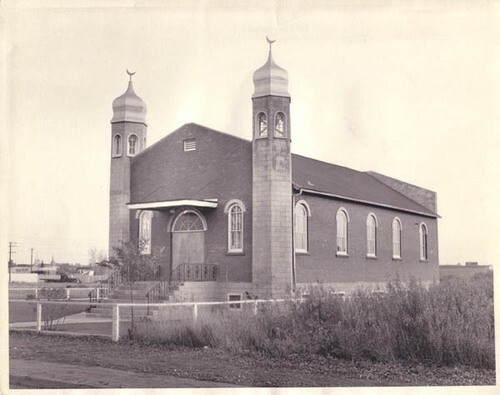 The mosque became a community hub, as the Muslim community would host dinners and events for the broader Edmonton community, regardless of their faith. The building currently resides in Fort Edmonton Park as a heritage site, where it is under the care of Richard Awid, a descendant of one of the first Lebanese immigrants who settled in the city, and is still used as a place of worship. Ultimately, the Edmonton Heritage Council approved a $15,000 grant for the project, much to the surprise and delight of Omar and The Green Room team. The next inevitable question was: what would a Canadian Prayer Rug look like? Do a quick search of prayer rugs, and you’ll see many motifs present in them: archways, geometric arabesques, domes, often in hues of red, gold or green. Some have mosques or the Ka’bah — the holy mosque in Mecca — featured prominently in their designs. While these rugs are very beautiful and ornate in and of themselves, they are a reflection of the culture in which they are created. To a western audience, the designs of a prayer rug — even Islam as a whole — remain largely in the realm of foreigners and desert dwelling Arabs, imagery held over from the orientalists. These images, and the beliefs associated with them, remain on the periphery of acceptance. To your average person, they’re nice to look at, but not taken seriously as anything but another reflection of the “other”, from which much xenophobia stems. “Arabism” is often equated with Islam — that is, anything resembling Arabic culture is somehow Islamic. This is even more inaccurate when you realize there are a broad spectrum of cultures that get unfairly lumped in to just being “Arabic”, despite countries like Syria, Pakistan, India, Turkey and more having their own unique cultures. This is similar to how the broad spectrum of Indigenous cultures in Canada, including Cree, Blackfoot and Assiniboine, are all seen as interchangeable — and that’s without even getting into the differences between First Nations, Metis and Inuit. He stresses the necessity of creating a uniquely American — and by extension Canadian — Islam that reflects the bedrock of our own culture. The Canadian Prayer Rug was always seen as a means to that goal. The Green Room hiredMétis designer Kit Walton, who had a fascination with Islamic motifs and architecture, to solve the riddle of what the prayer rug would actually look like. Over the past year, Alberta has become the staging ground for the landmark Truth and Reconciliation commission, which has sought to bring to light the abuse and mistreatment of Canada’s Indigenous peoples at the hands of white settlers. Particular focus was given to the residential schools, which has sought to strip Indigenous children of their language and culture. Supreme Court of Canada Chief Justice Beverley McLachlin labelled the practice “cultural genocide.” It has since spurred everything from a revived interest in Indigenous culture to formal apologies by the Canadian government to the country’s Indigenous population. Many speeches by Alberta’s premier begin with acknowledgement of being on Treaty 6 territory, alluding to the historical document signed in 1876 by 50 First Nations bands that covered land use in most of Alberta and Saskatchewan. Incorporating the Indigenous story into the rug required tact and respect, but not so blatant and obvious as to “tokenize” it, as Taouba Khelifa, Program Manager for the Green Room, put it. After all, the easy way out would just be to slap a medicine wheel in the middle and call it a day. On the other hand, the rug had to acknowledge the history of the Muslim community here, while reflecting the universal aspects that every Albertan holds dear. The shape and design of the rug went through several iterations. At one point, leather was considered as the medium for the prayer rug, a reflection of Alberta’s ranching history. Other designs had the rug shaped like the province itself, the design being an aerial map that included depictions of mountains, plains and the North Saskatchewan River. Symbols considered included prominent Albertan flora, like Saskatoon berries, pine cones, and cattails. The prominence of the Al Rashid mosque on the rug was also an element that required thought; would the building itself be woven into the pattern, or would its presence be shown through symbolism? Of course, Edmonton’s reputation as “oil country” also came up as well. “There was a joke that ‘perhaps this rug will be made out of petrochemical product,’” Taouba says. As Kit worked on the face of the rug, her designs also had to be mindful of the medium of weaving. “Traditional prayer rugs are quite intricate and I couldn’t really do anything too intricate because of the weaving techniques,” she said. Weaving as a medium doesn’t allow for fine, intricate details the way embroidery or stitching does. Even still, certain elements of the rug — such as the crescent moons — would later be embroidered. Noor Iqbal, an elementary school teacher and weaver of the prayer rug, worked with Kit to brainstorm ideas of the design, and translate the designs into something that was feasible to weave. Weaving is a textile art in which two distinct sets of yarns are interlaced together, typically on a loom, to produce a fabric. As a medium, weaving itself is an integration of cultures. 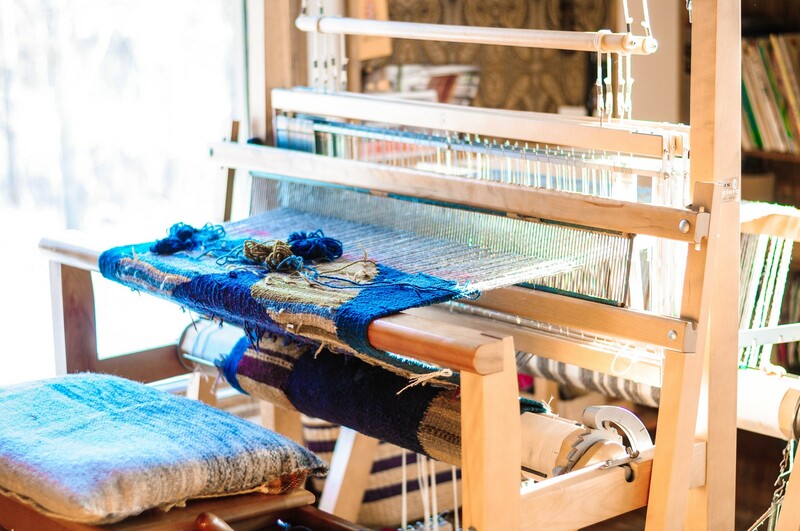 The project used only locally sourced wool and dyes made from plants and herbs native to the Edmonton region to further reflect the spirit of locality. However, it also limited the colour palette that could be used in designing the rug, as natural dyes and wool typically produce more subdued colours, not the more vibrant and saturated tones found in regular textiles. The design process for the rug took over 4 months of research, brainstorming, and various iterationsbefore landing on a main focus and design. Ultimately, the focus of the rug came down to Alberta’s one universal aspect that connects everyone living in it, whether Indigenous or immigrant, born-and-raised or newly-arrived, religious or not. For Kit, it tells her story, being Métis, and growing up in rural Alberta and experiencing the landscape. For her, incorporating the natural aspects of Alberta was important, as a reminder of how people should respect the land and, by extension, the place they live in. The final design is a testament to the story of Alberta’s land — from the boreal forest to the central agricultural plains, to the mountains and rivers to the west — and the shared history of its peoples. All of these threads have been woven together to create something beautiful. 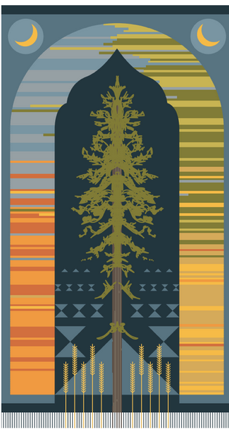 At the center of the rug stands Alberta’s official tree, the lodgepole pine, mimicking the motif of Cyprus trees found on traditional Syrian and Lebanese rugs. Surrounding the tree is an arch — a common feature in traditional rugs — which is inspired by the architecture of the Al Rashid mosque. The arch shifts into four sets of rich colours, representing Edmonton’s bold seasons, while also paying homage to the four cardinal directions. The two crescent moons in the top corners symbolize the crescents on the Al Rashid mosque and the Islamic lunar calendar. The wheat on the bottom represents Alberta’s prairies and its abundance of food, and the blue triangles represent the Rocky Mountains and the flow of the North Saskatchewan River. The overall theme of the rug is to promote a sense of welcoming. In Cree, the word pehonan means “gathering place.” Similarly, the Arabic wordmasjid refers to a gathering place, serenity, and home. This rug is meant to be a symbol of home, and that no matter where we come from, this land — “glorious and free” — is our home. We are at a unique time in the story of Alberta. Last May, the 40 year reign of the Conservatives came to an abrupt end as the left-leaning New Democratic Party was elected into power. Shortly thereafter, Alberta’s oil economy — its key resource — crashed. With the Truth and Reconciliation Commission, there have been many stories coming out of the darker side of Alberta’s history of residential schools. With it has come the beginnings of a renewed respect for Indigenous culture and language. These stories are part of the longer narrative of the Indigenous peoples and their experiences on the land. Recently, thousands of Syrian families joined the rich collection of Alberta’s ethnic milieu. Like the founders of the Al Rashid, they are families in a new land, striking out to find their own sense of community and belonging. Their stories, and the stories of the children who follow them, are just beginning. Yet there are ways to speak across that historical divide. The Canadian Prayer Rug is a nexus point for all these stories. 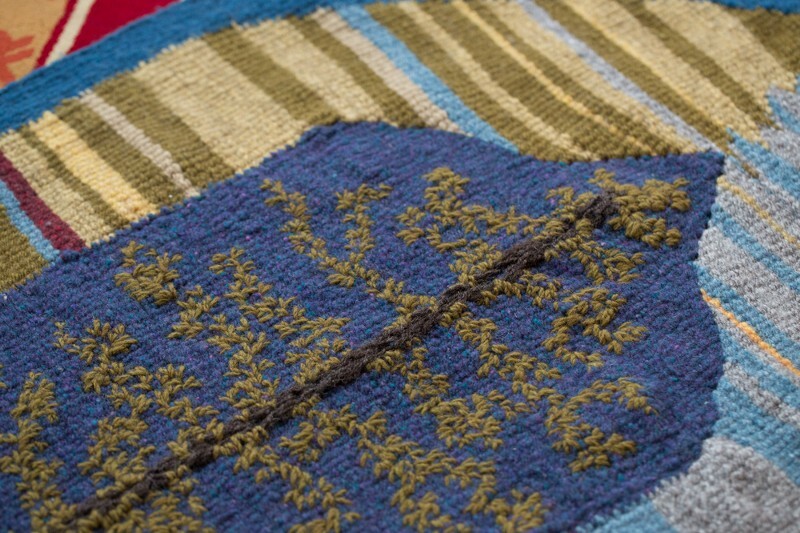 In a broader sense, the rug helps to engage with social issues that have been relevant in Edmonton, both in the past and now, from the challenges of reconciliation with the Indigenous people, to recognizing that Muslims have a pivotal role in terms of engaging with the broader society, to our treatment of the land. It’s meant to recognize that these stories are a way to connect our past and future stories, to see the common threads that unite us all, and to build a tradition of cooperation, caring, and love. It’s meant to tell the people here — Indigenous, Syrian, Caucasian, whoever — “This is your story and you belong here and there are people who have come before us who built our community and now are continuing to contribute to that,” says Taouba. The Canadian Prayer Rug is meant to weave together our stories. It is a story of the land. It is a story of resilience. It is a story of community, growth, and home. It is a story of past, present, future — humanity, forgiveness, spirit. And as we continue to spin the yarns of our own stories, we must never forget that we are all, each and every one of us, one mere thread, woven together with many others on a beautiful tapestry. This article originally appeared on Ummahwide on August 31st, 2016.